My interest in Alta grew with the formation of the Northwest Arkansas Regional Greenway, which runs through my hometown of Fayetteville, Arkansas. The Greenway allows the community to see their unique place more clearly by revealing an environmentally rich and historically significant corridor at the heart of the city. I am captivated by the rapid cultural shift toward non-motorized transport that Alta makes possible, and committed to the creation of these kinds of spaces through my position at Alta. Hannah graduated from the Fay Jones School of Architecture at the University of Arkansas in 2014 with a Bachelor of Landscape Architecture and moved to Portland, Oregon soon after graduating to experience a pedestrian-oriented city. She worked with Learning Landscapes designing imaginative nature-play spaces for children. 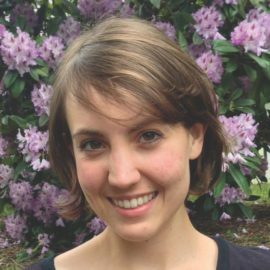 Hannah joined Alta in spring of 2016, bringing environmental planning knowledge, public engagement knowledge, concept design experience and graphic support to the firm. Her passions for creating interactive spaces, landscape architectural theory, and environmental sensitivity are expressed as recurring themes in her work.